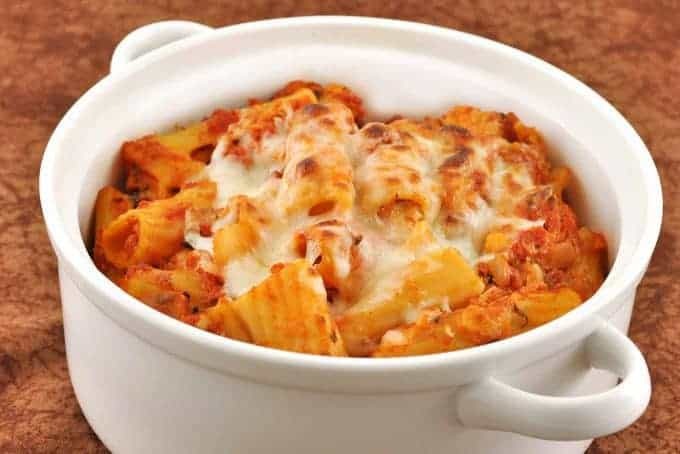 Baked pasta dishes are a perennial favorite with just about everyone. They’re easy to prepare and can be made with a wide variety of ingredients. 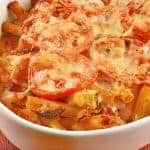 This recipe combines rigatoni with sautéed pancetta, a “pink sauce” made with tomatoes and ricotta cheese, lots of fresh basil and some shredded mozzarella. It may sound rich, but because we don’t go overboard with the cheese, it’s actually surprisingly light. 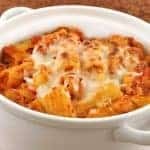 An easy baked pasta dish made with rigatoni, pancetta, ricotta-tomato sauce, fresh basil and shredded mozzarella. Preheat the oven to 375°F and put a large pot of salted water to boil for the pasta. Heat the olive oil in a large skillet over medium heat. Add the pancetta and sauté for 2 minutes, then add the onion. Continue cooking until both the onion and the pancetta are very lightly browned, 2 to 3 minutes longer. Add the garlic and cook until fragrant, 1 to 2 minutes. Add the wine and cook until the liquid reduces slightly, then add the tomatoes and oregano. Bring the mixture to a simmer and season to taste with salt and pepper. Reduce the heat to medium-low, cover and continue cooking for 7 to 10 minutes. While the sauce simmers, cook the pasta according to the package directions, drain and set aside. 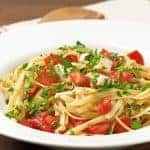 Stir the ricotta cheese into the sauce, taste and adjust the seasoning as needed. Add the pasta and chopped basil and combine thoroughly. 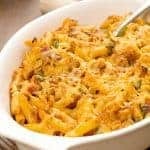 Coat a 2-1/2 to 3 quart shallow casserole dish with nonstick spray. Spoon 1/2 of the pasta mixture into the dish, then top with 1/2 cup of the mozzarella. Add the remaining pasta, and top with the balance of the mozzarella, cover and bake for 25 minutes. Remove the cover and return to the oven for 5 minutes to lightly brown the cheese. 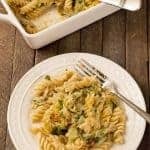 Serve with a green salad tossed with Italian vinaigrette.